If you're asking the same question, then I know you'll be interested in my recipe guide that I created with specific healing foods for your digestive tract. I want to offer you this customized recipe book of over 100 Anti-Constipating-Bowel-Regulating Recipes for only $27 $5 with your purchase of "37 Constipation Home Remedies For Women." Your gastrointestinal situation is unique and you can't just rely on any recipe book off the shelf. They may have great stuff, but you'll need to play a bit of "menu roulette" in order to figure out what works for you. 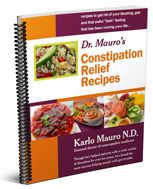 My Constipation Relief RECIPES will show you exactly what you need to eat to have better bowel health and stay that way. No diet book can compete. This is like getting your own customized cookbook. You'll know exactly what foods are like MEDICINE for your digestive tract. It could be life-changing to you. If you haven't been following a diet suited to your bowel health... and haven't been getting any better, then this could be exactly what you need to regulate your bowels, boost your energy, lose some weight and relieve your stomach bloating & gas. If you have SIMPLE recipes to follow, which include foods that you ENJOY and don't upset your stomach... well, eating wouldn't really be all that bad, would it? My Constipation Relief RECIPES are here to make your colon healthier while making your life simpler! If you're not 100% satisfied with either product just email me directly (within 60 days of purchasing) and I'll give you a complete refund, no questions asked. 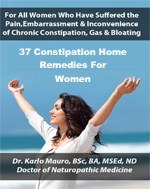 "37 Constipation Home REMEDIES For Women"
You will get immediate access to the 2 ebooks as soon as you make your payment. You won't have to wait. Even if it's at 2 AM in the morning! You will get immediate access to the 37 Remedies as soon as you make your payment. You won't have to wait. Even if it's at 2 AM in the morning! You will get immediate access to the Constipation Recipes as soon as you make your payment. You won't have to wait. Even if it's at 2 AM in the morning!